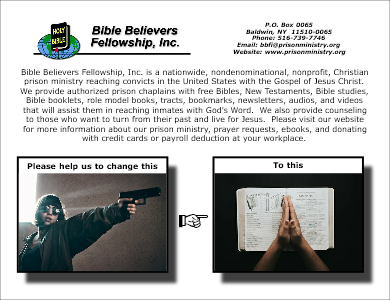 Posters for Bible Believers Fellowship, Inc. Put up our posters on bulletin boards or hand them out where permitted. 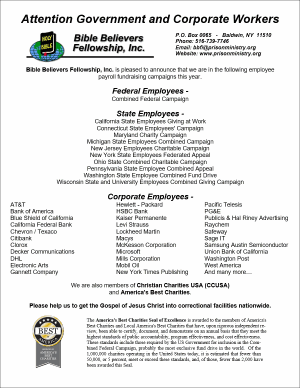 This is a great way of notifying people about Bible Believers Fellowship, Inc. and our Christian mission. 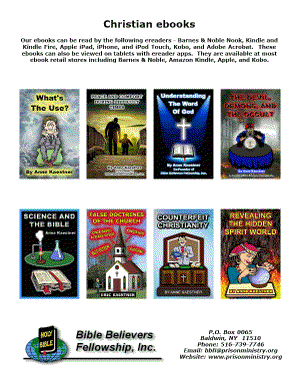 The posters available include our Christian ebooks (2 pages), government and corporate workplace campaigns that we are in, and information about our 501(c)(3) nonprofit organization. Click on the poster below you want to view. The poster will appear in Adobe Acrobat (PDF) format in a new tab. Use your color printer to make a poster that you can distribute.